Walking is a great way to travel around Austin, and we’re working to make it even better. 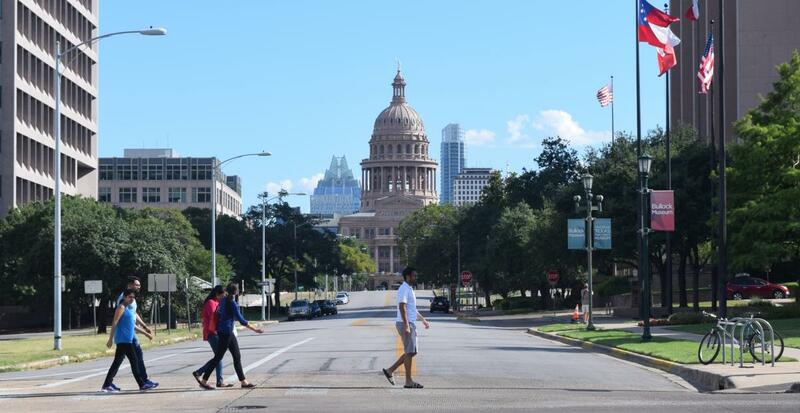 The City of Austin's Pedestrian Program works to advance a safe, connected and appealing environment for people walking on our streets – and encourage walking and safe behaviors. Walking delivers many benefits for our residents and our community as a whole. It’s affordable transportation, a healthy daily habit, and friendly to the environment. Every trip begins and ends with a pedestrian trip, including transit and vehicle trips. Walking for short trips – to lunch, to run an errand, to school – makes it easy to meet the recommended fitness goal of 10,000 steps a day. See our Pedestrian Safety and Law brochure, which explains what every driver and pedestrian should know about pedestrian laws to promote a safe environment for people walking in Austin. The City’s volunteer Pedestrian Advisory Council, Vision Zero Task Force, advocacy groups and diverse Austinites and groups actively help to shape our work. On individual projects, a public process invites neighborhood and stakeholder input. It includes people traveling as pedestrians with wheelchairs, scooters, or other assistance. The City is continuously upgrading sidewalks, ramps, and the pedestrian network to make it ADA accessible. For sidewalk or street service requests, call Austin 3-1-1 (or 512-974-2000) or submit issue online.